We would like to think that we are impartial to the unlovely or to the poor. We may minister to them in some way. This is great but are we truly caring and having a pure motive? 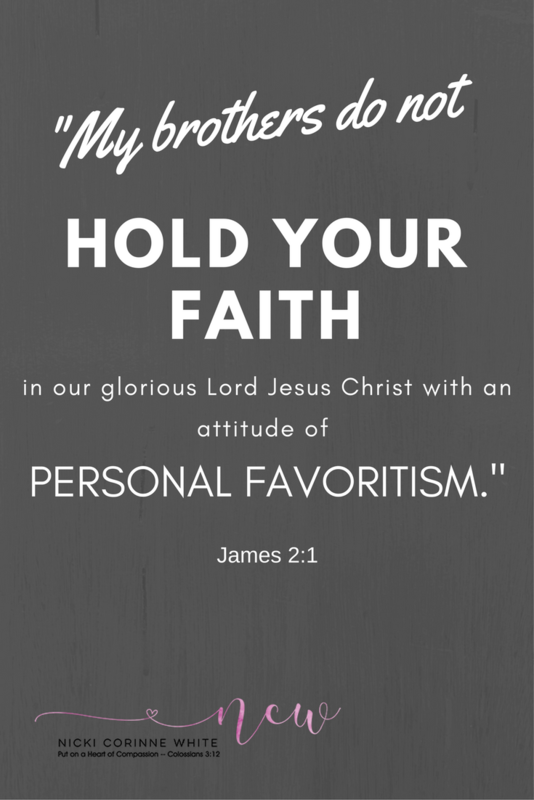 In James chapter two verse one it states, "My brothers, do not hold your faith in our glorious Lord Jesus Christ with an attitude of personal favoritism." It then explains that we pay more attention to someone dressed nice. Then tells us in verse 5 that God chose the poor of this world to be rich in faith and heirs of the kingdom which He promised to those who love Him. And in verse 13, "For who has shown no mercy; mercy triumphs over judgement." I myself look the other way when I come to a corner of an intersection and there is a panhandler. I have questions, are they legit? But...they still need Jesus. They still need help. Verse 17-18 tells us, "Even so faith , if it has NO works, is dead, being by itself. But someone may say, 'you have faith, and I have works: show me your faith without your works, and I will show you my faith by my works." and verses 19-20 "You believe that God is one. You do well; the demons also believe , and shudder. But are you willing to recognize you foolish fellow, that faith without works is useless? I think this is a work in progress for all of us. I think there is also a correlation between faith and works. But faith comes first. We do not earn our faith but rather feel compassion out of our love for God and others. There is a phrase in an old gospel song that says, "Faith without works is like a song you can't sing. It's just about as worthless as a screen door on a submarine." Let's reach out to those we know need our practical help this week. Pray for God to show you who needs your help. This doesn't mean you have to have be rich to help. Everyone can reach out to someone in need. A kind act, a small item. A ride somewhere. Lord, help us to be mindful. 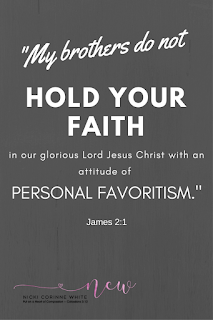 Help me to look at others, all others with no favoritism.